The 2018 results vindicate our strategy, which is for ‘Growth, based on a complete and integrated services offering, that targets margin improvement’. This integrated offer is attracting demand because, in plain terms, it de-risks increasingly complex construction programmes and helps clients meet their targets. The trend for major projects to become more complex is permanent. This is not just a question of increased application and integration of digital and data technologies to make a building ‘smart’. It is equally a matter of ever-increasing environmental standards being targeted. Overall, end users want their buildings to achieve more and they also want the fastest possible programmes to be delivered safely. All of this increases market demand for specialist contractors such as TClarke. For example, towards the end of the year, a key element of our integrated Technologies offer – our new offsite manufacturing facility at Stansted – was instrumental in helping us win our largest ever mechanical project at Kings Cross, London. Our focus on sustained margin growth provides clarity across our operations and guides our decision-making and appetite for risk. We target the work that is right for us, we focus our resources for the benefit of our clients and our people deliver high quality work, safely. 2018 has been the first full year in which we’ve had the whole business working on common operating systems and procedures, following the successful Group reorganisation. The work undertaken in recent years to achieve this common Group operating system has helped underpin all the progress made in 2018 – whether that be in allowing us to open new offices or in supporting so many successful tenders. TClarke’s well known commitment to full-time jobs, our roots in our local communities across the UK and our commitment to apprenticeships, decade by decade, means we have a significant, highly-skilled and loyal UK based workforce. In 2018 we successfully introduced our Future Leaders programme to further secure our talent pool going forward. In 2018, the UK Government confirmed that the ‘Social Value’ created from public sector procurement would become a ‘required’ element from summer 2019. This is a trend with growing impact in the private sector too. For organisations like TClarke, which deliver substantial, measurable social value, this is a positive trend which will further enhance our market appeal. It has been very pleasing to see TClarke’s name associated with excellent projects that are really helping to build a better Britain: major infrastructure projects like Stanmore Hospital, Bank Underground Station and the £8bn ESFA school building programmes; Dyson’s campus expansion in Wiltshire, Virtus Data Centre in Slough and the new John Lewis stores in Cheltenham and Westfield London. Our residential business goes from strength to strength and in Scotland we delivered 2,545 new homes in 2018. In so many cases these are customers coming back to TClarke, time and again. TClarke works hard to retain customers through quality work and service and our 2018 numbers reflect that. In London, where, according to Deloitte’s latest ‘London Office Crane Survey’ there are currently around 11.8m sq. ft. of prime commercial space under construction, 2018 saw us involved in many of those landmark schemes. We were delighted to see one of our landmark projects, Bloomberg London, winning the RIBA Stirling Prize in 2018. 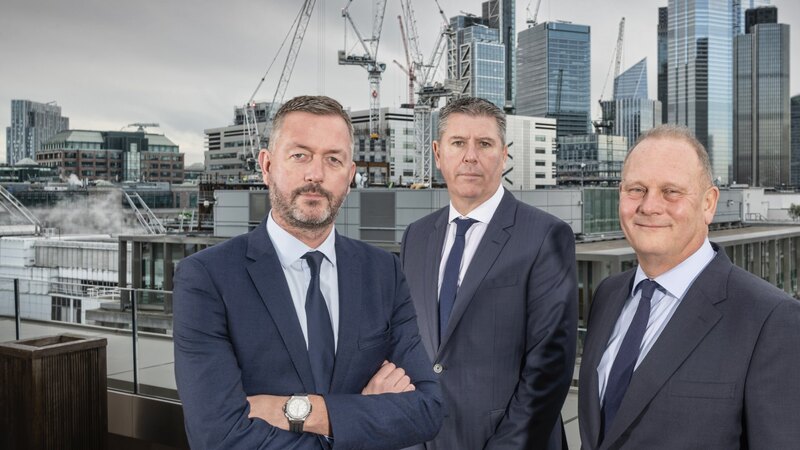 We were equally delighted at the continued growth of our Mechanical and Engineering business to the point where we are delivering and winning major projects like Southbank Place and at the International Quarter London (IQL) on a regular basis. It is important to note that, despite concerns around the impact of Brexit, our core London M&E market’s confidence remains solid. At the end of 2018, The City of London released details of a further round of major developments in the City’s eastern cluster and a vision for the skyline in 2026. Although short term uncertainties may persist, the underlying confidence is evident in our developer and principal contractor client base. Our acquisition and successful integration of Eton Associates is important to note for two reasons. Firstly, Eton expanded our Technologies capability and deepened market confidence in our integrated services proposition. Secondly, Eton’s effective embedding within the business is another demonstration that the Group systems are effective. Eton has rapidly become a highly valuable part of TClarke. 130 years ago, Tommy Clarke set up shop in Knightsbridge, London. It was a venture into the great new technology of the age – electricity. I think he would be proud to see the company that bears his name as an industry leader in the new technologies of our age – and still retaining the same focus on committed people, with deep expertise doing the best job possible, which he established. I conclude by restating our continued commitment to health, safety and wellbeing, above and beyond everything else. I am very proud to see our Mindfulness classes so well attended and look forward to the programme being rolled out nationwide. I am also very proud of the work our people and our health and safety teams do to make safety our number one priority and front of mind wherever we work, on a daily basis. That will always be the case at TClarke; just like the commitment to high quality work, it is central to who we are.